I’ve got a few first world problems, and if you don’t mind hearing me out, I’ll be quick. First, my husband got rid of my slow cooker. Second, in this same purge, he ousted my ice cream maker. At the time, I was like ‘good riddance!’ My slow cooker was outdated and my ice cream maker had seen better days (I scratched the bottom with a knife trying to get the last bit out. In my defense, it was this peanut butter ice cream and you woulda done it, too). Then, the weather heats up, and all I want in life is shredded chicken tacos made in the slow cooker and ice cream for dessert. The only two things in the world completely out of my reach. It.stings. 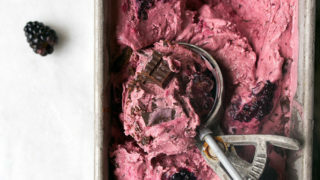 But, I proceeded onwards, not because I’m tenacious but because I’m stubborn–subtle difference, and I made blackberry chip no-churn ice cream. (But I also proceeded because the temptation to make ice cream that matched my pants was too strong-scroll down for that one). No churn ice cream is easy to make, but it relies on a can of sweetened condensed milk to keep it creamy. But here’s a secret: I don’t love sweetened condensed milk. It’s just too, um, sweet. It has a funky canned milk taste that I just can’t get over. The only acceptable use for it is tres leches cake, which is my birthday cake of choice each year. So, I not only wanted to make ice cream without an ice cream maker, I wanted to make it without condensed milk. Ready for this? It actually took me a few batches to get the flavor right. There’s a local dairy down the street from me that has blackberry chip ice cream on their summer menu, and I painstakingly endured several trips for flavor comparison. Camille came with me on each trip. It’s borderline child labor, making this kid eat so much ice cream, you know. After a few trips, Camille and I have decided we’re purple ice cream eating experts, and we have some wisdom to share. 1. 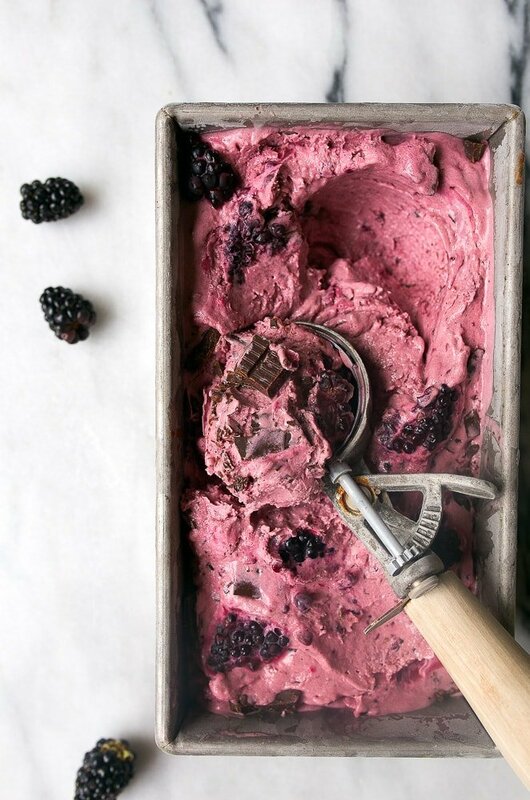 Blackberry ice cream should not contain vanilla extract. It distracts. Let the berries shine. 2. Lemon juice is essential for the blackberry flavor to shimmy and shine. 3. The straining of the blackberry puree is entirely optional. My current batch has seeds, the previous one didn’t. We’ve plowed through both containers at the same speed. 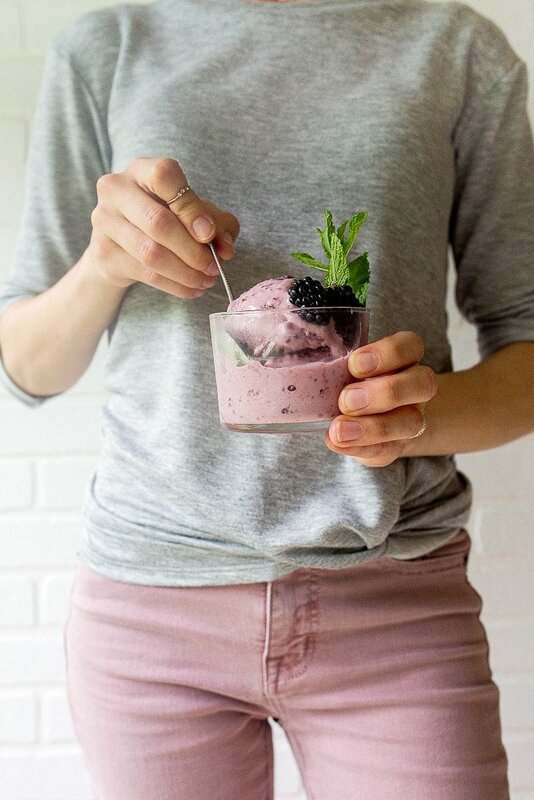 One final thing: get the best quality blackberries you can, and yes–you can use other berries. Oh, and the chips! They should be your favorite dark chocolate bar, chopped largely. The bigger the chunks, the better. I’m in love with this method for no churn ice cream made without sweetened condensed milk. In a nutshell: make the blackberry compote, add cream & milk and bring to a simmer. Temper the egg yolks with the hot cream mixture, cool, freeze, and beat with a hand mixer a few times over the first 2 hours. Easy! In a medium saucepan, add the blackberries and sugar. Bring to a simmer, and crush with a wooden spoon while they soften, slump and release their juices (about 5 minutes). (Optional: strain the mixture before proceeding). Stir in the lemon juice, cream, milk and salt, and bring to a gentle simmer (bubbles around the edges of the pan only). Meanwhile, have the egg yolks ready in a medium-sized bowl. Gently ladle about a 1/2 cup of the warm cream mixture at a time over the egg yolks, whisking constantly. Go slowly, and once you have about 2 cups of cream in the bowl, you can pour the rest in. Stir very well. Cover and chill the mixture for at least 4 hours, or overnight. Pour the chilled ice cream mixture in a shallow dish (I used an 8x8" brownie pan), and sprinkle the chopped chocolate on top. Place in the freezer, and every 30 minutes, beat with an electric hand mixer until fluffy. After 2 hours, it should be perfect (but still a bit soft). Cover and freeze until firm, but let rest on the counter for 5 minutes before scooping and serving. I always want to make no churn ice cream but never have sweetened condensed milk, so this recipe is great! 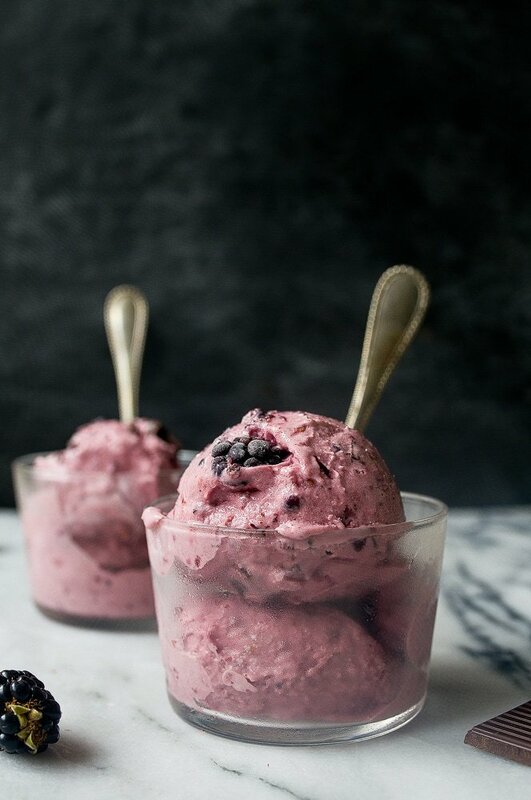 I LOVE black raspberry ice cream with the little chocolate flecks and this is such a gorgeous color, I will definitely need to make this! Stupid question but can you go ahead and use an ice cream maker for this? Yes, of course, Marina :) I hope you like it! No one has thrown away my ice cream maker. Is there any reason I can’t make this in it? Of course, Nancy. Go ahead. This looks heavenly! 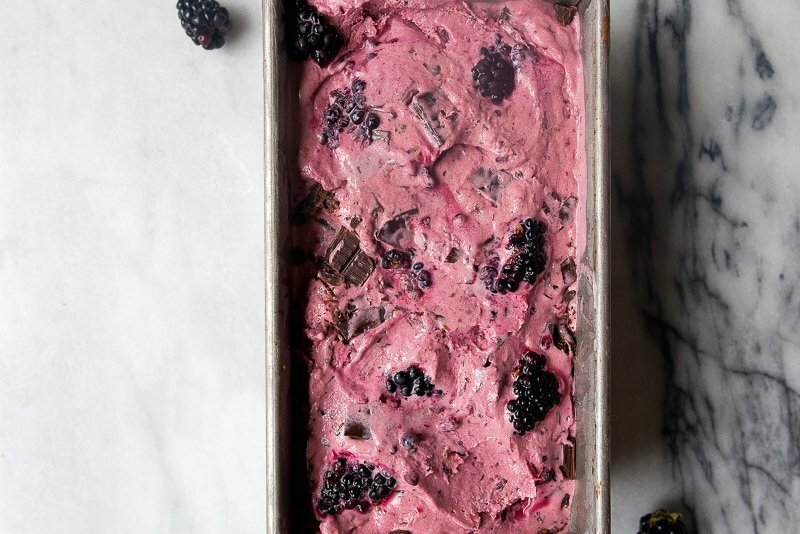 I absolutely adore the combination of dark chocolate and blackberries. A sprig of fresh mint is such a great way to make it refreshing for summer. This is wonderful – I never manage to have sweetened condensed milk around so I never get a chance to try all those wonderful no-churn recipes I see everywhere. My question – is it possible to use this as a base recipe for other mix-ins? The cream, milk, salt, and egg yolks … and then experiment with other things? I’d be very interested in seeing this recipe adapted to a variety of other flavors. Classic ice cream has eggs(usually yolks). There are some eggless methods out-there, but this recipe is not eggless. This is seriously the BEST no churn ice cream recipe EVER. I hate the condensed milk and heavy cream method. Something About the flavor is very off putting. But THIS recipe is so versatile. I made it with blackberries, blueberries, and even strawberries. A HIT EVERY TIME. And the electric mixer idea? GENIUS!! It breaks up the ice and gradually whips the ice cream base, increasing volume and making everything fluffy like it came from an ice cream maker. BRILLIANT RECIPE! !